Signifi cantly reduce all forms of violence and related death rates everywhere. End abuse, exploitation, traffi cking and all forms of violence against and torture of children. 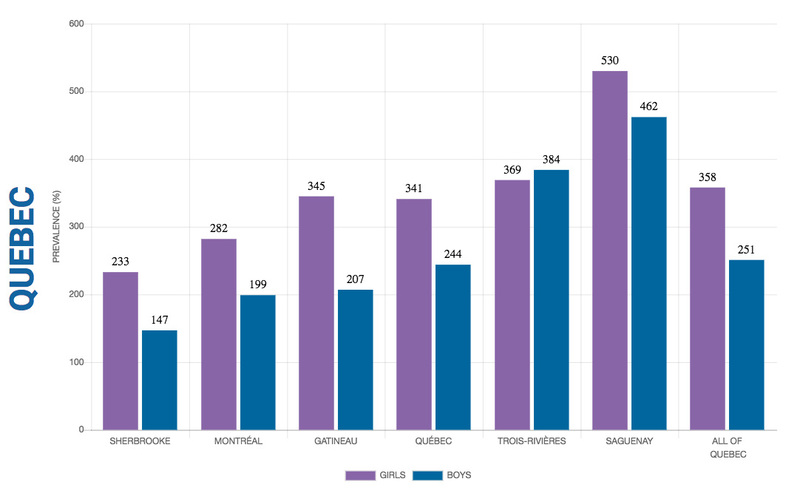 In Laval, 3,098 reports were received for a population of 85,184 children. 40% of the reports received were considered justified and were retained. One-third of retained reports affecting children under 18 were due to neglect or risk of neglect. Physical abuse or risk of physical abuse, and psychological mistreatment were the second and third cause of retained reports. In Quebec, the number of reports received regarding children under six has increased yearly, from 37 per 1 000 in 2007–2008 to 52 per 1 000 in 2015-2016. The retained reports involving very young children also increased, but at a low errate than for reports received. Neglect or serious risk of neglect are the most frequent reasons for retained reports involving children under the age of six. * NOTE : The reports for Montréal include data from Centre Jeunesse de Montréal providing services to a francophone clientele, and the Batshaw Youth and Family Centres providing services to the anglophone population as well as to the Jewish community. DOMESTIC HOMICIDES ARE EXTREMELY SERIOUS BUT RARE EVENTS: IN 2014 IN QUEBEC, FIVE CHILDREN UNDER 18 WERE KILLED IN DOMESTIC HOMICIDES. IN A 10-YEAR PERIOD, 58 CHILDREN WERE MURDERED IN QUEBEC. 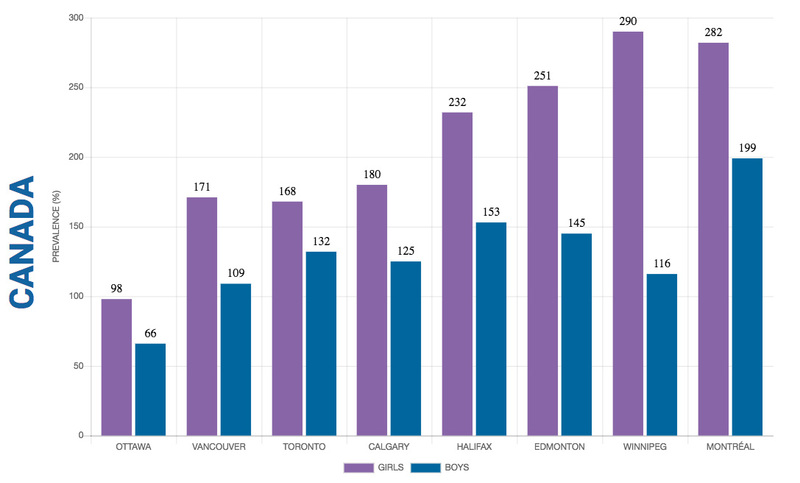 In the Montréal Census Metropolitan Area in 2015, 1,852 cases of domestic violence against children under 18 were reported to the police, representing 282 cases per 100 000 involving girls and 199 cases per 100 000 involving boys (Figure 10.1). These are among the highest rates for all metropolitan areas in Canada. Rates from other metropolitan areas in Quebec are even higher than Montréal's. In 2015–2016, Quebec's Youth Protection Services received 87,800 reports. Of this number, 34,911 were retained. 29,856 children were involved in at least one report that was retained. SOURCE: Burczyckam M. and S. Conroy (2017). Family Violence in Canada: A statistical profi le, 2015. Juristat. Statistics Canada Catalogue, No. 85-002-X. According to the 2010–2011 Québec Health Survey of High School Students, 40% of high school students in Montréal declared they had been a victim of at least one form of violence either at school, on the way to school or through cyber bullying. This is a higher rate than for all of Quebec (36 %). Boys reported higher numbers of interpersonal violence than girls: 48% vs. 33%. Proportionally more students in Secondary 1 and 2 than in Secondary 3–5 stated reported having been a victim of interpersonal violence. Students in disadvantaged areas were more likely to be victims of violence or to demonstrate indirect aggressive behaviours. In Montréal in 2010–2011, 40% of high school students stated they had suffered violence in their love relationship in the 12 months prior to the survey. Proportionally, more girls reported suffering a form of violence at the hands of their partner: 48% vs. 31%.